Feel free to take the challenges in any order, however, I’ve designed them to build upon each other. What you learn in lesson one, you’ll use in subsequent lessons. 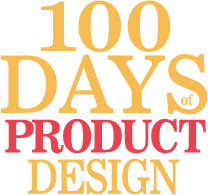 So if you’re very new to product design, you might want to start at the beginning and keep going in order. This is a work in progress. I’m adding challenges every day. So if you only do one per day (which I recommend) I’ll always be ahead of you. Come back tomorrow for your next challenge!